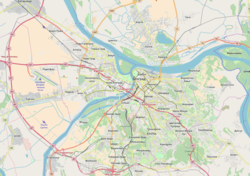 Topčider (Serbian Cyrillic: Топчидер; Serbo-Croatian pronunciation: [tɔ̝̌pt͡ʃide̞r]) is a forest park and an urban neighborhood of Belgrade, the capital of Serbia. It is divided between the municipalities of Čukarica, Rakovica and Savski Venac. Being close to downtown, it is one of the major locations for relaxation, picnics and fresh air for the citizens of Belgrade. Nobelist author Ivo Andrić wrote: "You just hang on to Topčider and Košutnjak...Topčider is my favorite place, where I ate bread and drank wine in the sweetest and calmest manner". Geographically, Topčider covers a much larger area than what people generally refer to as Topčider today. The eastern slopes of Topčidersko Brdo ("Topčider Hill") begin already at the Mostarska Petlja and the highway. The neighborhood of Senjak is located on the western, and Dedinje on the right side. This is where the street of Topčiderski Venac and the roundabout of Topčiderska zvezda ("Topčider star") are located. The southern slopes of the hill extends into the valley of the Topčiderska reka, a tributary to the Sava river, which has been channeled in this section. This is the area identified with the term Topčider. Topčider Park begins five kilometers south of downtown Belgrade and extends west, east and south into the old Topčider woods which itself extend west into the park-wood of Košutnjak. In the upper parts, Košutnjak and Topčider forests grow together, while in the lower parts they are divided by the Topčiderska reka and a railway passing through the river valley (both Košutnjak and Topčider have their own, separate train stations). In the extreme north-west Topčider extends into the neighborhood of Careva Ćuprija and in the south-east into Lisičji Potok. It also borders the neighborhood of Kanarevo Brdo in this section. Topčider is mentioned for the first time in the 17th century travelogue of the Ottoman explorer and traveler Evliya Çelebi. During Ottoman times, the valley of Topčiderska reka and the Topčider wood were locations where the Turkish artillery was positioned, intended to defend Belgrade, being distant from the town itself at the time (thus many military barracks to defend the city from later periods, but the town later sprawled tens of kilometers further). This is how the area got its name as in Turkish it means "artillery men's valley" (top, cannon; topçu, artillery man; dere, valley), though it is usually erroneously thought to mean simply the cannon valley. Prince Miloš specifically choose this location. After Serbia gained autonomy, the Ottomans withdrew to the walled cities. As the range of the cannons from the Belgrade Fortress couldn't reach across the Topčiderska reka, prince selected this area for his future royal compound. The history of the park itself begins in 1830 when the Prince of Serbia Miloš Obrenović started building his personal quarters in the swampy terrain of the Topčider, today one of the major attractions in Belgrade, the famous Milošev konak. A stone Topčider church, dedicated to the apostles Peter and Paul, church inn and military complex were also constructed in the 1832-34 period, so as the various barracks, magazines, ice rooms, meyhane and a guard tower on top of the Topčidersko Brdo. There was a wooden pavilion, which served as part of the Russian military hospital during the 1876 Serbian-Ottoman War. Hundreds of workers were employed. At one point, 144 tajfe, or bands of construction workers, were employed. Prince Miloš paid them heftily, gave them certain privileges, but they had no working hours, and had to work until the job is done. The park was patterned after the English parks. The supervisor of the park's construction was Atanasije Nikolić. In 1926 the park was extended even closer to the city when the forestation of Topčidersko Brdo began, extending the original woods. International tender which was supposed to reconstruct Topčider by the standards of the then modern urbanism was halted by World War II. The importance which Topčider gained for the city population can be seen from the fact that in 1884 it got its own railway station even though it was a small settlement at the time and also one of the very first tram lines in Belgrade used to connect Terazije and Topčider, through the Kneza Miloša street. Starting in downtown, at Prince Mihailo Monument, the tram was allocated the number 3, which it still bears today, though its route is today extended to the neighborhood of Kneževac. When Serbia began using paper money, the banknotes were printed in France until 1929, when the Banknotes printing office was built in Topčider, close to the railway station. However, the coins were minted on another location, in the privately owned company "The brothers Bošković mint" in the nearby street, today named Bulevar vojvode Mišića. In the mid-1930s a big affair broke out, concerning the counterfeiting of the coins of 50 dinars, so the Banknotes printing office also took over that job. It was always colloquially called the "Mint". After the Karađorđević royal family moved in the new Royal Compound in Dedinje in the 1930s, a modern military barracks were built in Topčider, as a headquarters of the royal guard. Additional military objects were also built, including the military farm. Park was partially adapted, with gazebos, bridges, etc. Railway station became the "royal station", while after World War II it became the home station of the Josip Broz Tito's famed Blue Train. After 1945 city urbanists considered that the way the Topčider-Košutnjak complex had been handled was wrong, especially the expansion of the railway station into the marshalling yard and the construction of Filmski Grad, so Belgrade's General Urbanistic Plan (GUP) in the 1950s projected the complete removal of the railway objects from the Topčider valley, but this was never implemented. In the early 2016, a gradual moving of trains from the Belgrade Main railway station to the new Belgrade Centre railway station, colloquially called Prokop station began. In December 2017, all but two national trains were dislocated to "Belgrade Center". However, problems arose immediately. The Prokop is still not finished, has no station building nor proper access roads and public transportation connections with the rest of the city. Additionally, it has no facilities for loading and unloading cars from the auto trains nor was ever planned to have one. Still, in January 2018 it was announced that the station will be completely closed for traffic on 1 July 2018, even though none of the projects needed for a complete removal of the railway traffic are finished. The Prokop is incomplete, a projected main freight station in Zemun is not being adapted at all while there is even no project on a Belgrade railway beltway so a series of temporary solutions will have to be applied. One is a defunct and deteriorated Topčider station, which will be revitalized and adapted for auto trains until the goods station Zemun is finished. Topčider station has one major flaw, a bad public transportation connection (only one tram line, No. 3), so the state railway company asked officially for this problem to be solved. A deadline for the Zemun station is 2 years, but the work is not scheduled to begin until the end of 2018. By 1883, Topčider had a population of 767, and though part of Belgrade, it wasn't organized as a quarter of the city, like the central urban area. According to the censuses, the population was 1,675 in 1890, 2,815 in 1895, 2,818 in 1900, 3,534 in 1905 and 3,510 in 1910. After the liberation in World War I in 1918, Topčider came under Belgrade's administrative rule. It was organized as a Topčider-Senjak section of Belgrade, which had a population of 8,476 in 1921. In the second half of the 20th century, the part which was within the Savski Venac municipality was organized as a local community (mesna zajednica), a sub-municipal administrative unit. It was named Topčidersko Brdo and had a population of 5,333 in 1981. It was then merged with Senjak again in the Topčidersko Brdo-Senjak local community which had a population of 7,757 in 1991, 7,249 in 2002 and 6,344 in 2011. Tree planting began immediately after the konak construction in the 1830s. 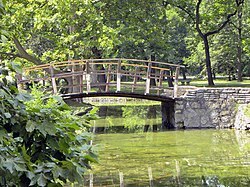 In the 19th century it was the first nursery garden in Serbia,. Most abundant species are platanus, black pine, spruce and field maple. The Topčider London Planes (Platanus × acerifolia) are today among the oldest ones in Europe. The biggest and oldest specimen was 34 m (112 ft) high in 2008, with the diameter of the deck being 55 m (180 ft), while the shade of its crown covers an area of 1,400 m2 (15,000 sq ft). Some sources claim it was planted in 1834 when prince Miloš ordered for a seedling to be planted in the lime kiln in front of the konak. Other, more reliable sources say the tree was planted in 1868, when 250 seedlings of Platanus were bought in Vienna, Austro-Hungary, for which a receipt still exist today. In 2015 it measured 37 m (121 ft) in height and was estimated to be 160 years old, while the crown has grown to 1,885 m2 (20,290 sq ft) and is now supported by the 17 metal piles. The tree is declared a natural monument. Even older is the almost 180-year-old pear tree, nicknamed Kruška topčiderka ("Pear of Topčider")  According to popular legend, it was planted by prince Miloš a few years after the konak was finished. He wanted to redeem himself to his wife princess Ljubica because of his frequent infidelities and in front of the pear seedling swore his loyalty to her. It still bears fruits, so attempts are being made to produce its seedling in the greenhouse. The pear is surrounded by five pedunculate oaks, all of which are over 100 years old. Special feature in the park is the group of 8 swamp cypresses. In 2015, most of the trees in Topčider were 20 to 70 years old, but a significant number of trees was over 100 years old or from the 19th century. Topčider is home to 26 species of dragonflies, 48 species of orthoptera and 153 species of beetles. Birds include collared dove, white wagtail, common blackbird, typical warbler, grey heron and great spotted woodpecker. Mammals present in the park, among others, are squirrels, moles, hedgehogs, voles and bats. Topčider was the first public park outside the central city area. Today, the total area of Topčider is 35 ha (86 acres), out of which 12.8 ha (32 acres) is covered by the park. The entire Košutnjak-Topčider forest complex covers an area of 3.46 km2 (1.34 sq mi). Many other monuments are centered on the konak: the binjektaš stone ("hopping stone") which prince Miloš used to jump on a horse, the Museum of the First Serbian Uprising (in the konak itself), three public drinking fountains with an additional fourth one with lion's heads which was temporarily moved to Topčider in 1911, but restored in 1976 and returned to its original location in Terazije, and the stone obelisk erected in 1859, one of the first public monuments in Belgrade. A bronze monument to the Swiss doctor and philanthropist Archibald Reiss (by Marko Brežanin) was erected in 1931. The northern section of Topčider is the location of the Topčider cemetery (with the Orthodox church of Saint Trifun) and the Banknotes printing office (Zavod za izradu novčanica), that is, the mint of the National Bank of Serbia. In the western section, bordering with Dedinje is Beli Dvor, a court of the Serbian former royal dynasty Karađorđević and the present residence of the pretender Aleksandar Karađorđević and his family. Northwest section of the Topčider is declared a geological natural monument of "Senonian ridge of Mašin Majdan". The location is an archaeological excavation site as the fossils of the Mesozoic fish have been found in the sediment layers from the Late Cretaceous. It was named Mašin majdan ("Maša's quarry"), after a quarry owned by Mrs. Maša Dimić who lived in the house above the quarry. It was operational until the 1920s and the stone from the quarry was used for the villas on Topčider and Dedinje, but also for the construction of the nearby railroad. On the location of the former quarry, the Topčider summer stage was built in 1947. It had 1,800 seats and an excellent acoustics, being embedded into the limestone rocks. A project of Rajko Tatić, despite occasional public actions for its restoration (1999, 2009), by the 2010s the facility was abandoned and deteriorated. The Great Platanus, in front of the konak, was protected as the natural monument in 2001. As the city government declared the entire Topčider Park a natural monument on 23 June 2015, specific protection for the Platanus ceased. In the area of the residential Obrenović dynasty complex, there are six objects which are protected as the cultural monuments: Residence of Prince Miloš, Topčider Church, Church Inn, Obelisk, monument to Archibald Reiss and the "Woman harvester" monument. There are threats of destroying certain parts of the park because the government is planning to build a tunnel in this area which will connect Autokomanda with this part of the city and hopefully solve many car traffic problems in Belgrade. Some environmental groups protested against this project, but the constructing of this tunnel still hasn't progressed further than the idea stage. During the summer of 2007, a general planning idea will be chosen by a tender held by the city government, and it remains to be seen if this plan will contain a solution for park preservation. Ada Bridge, which is part of the same project (Inner ring road) was built and opened on 1 January 2012, but the construction of the tunnel under Senjak, which should free Topčider from heavy traffic, was postponed due to the heavy costs. In the early 2018, city administration announced that the detailed regulatory plan and the conceptual design are finished, while the invitation to tender for the project was set for later in 2018. The tunnel would start at the large Radnička interchange, at the beginning of the bridge. That way, it would practically make an extension of the Požeška Street, the main street and commercial area of the neighborhoods of Čukarica and Banovo Brdo. The tunnel would then exit at Partizan Stadium, on the other side of Topčidersko Brdo, above the Autokomanda. The tunnel will allow for the drivers to circumvent the downtown and to allow faster transit. It is planned as part of Belgrade's Inner magistral semi-ring [sr]. The easternmost section of Topčider is a heavily wooded area, so the expansion of the neighborhood of Lisičji Potok was limited. In the early 2000s, due to the political changes which caused a vacuum in all levels of government, private entrepreneurs without gaining regular permits cut down over 1,000 trees in the Topčider woods for the purpose of constructing vast apartment complexes. The vast secret military complex of "Karaš" (in Teodora Drajzera street) was built and dug into the hill from 1965 to 1980, with numerous barracks and kilometers of underground passages. In October 2004, two young guards, Dragan Jakovljević and Dražen Milovanović, were found shot dead under highly mysterious circumstances. The first official army report stated that the two guards got into a fight; one got shot, and the other one committed suicide. The investigation was so obviously sloppy (videos were made public of investigators walking all over the non-secured crime scene, not using any precaution measures or security protocols, etc.) to the point of absurdity, including the notorious statement of then military prosecutor Vuk Tufegdžić who stated that no DNA tests were done because DNA is an "overrated thing" and that "people watch TV too much". Because of the serious rumours and intense public pressure, a more thorough investigation was initiated, this time headed by Božo Prelević, former interior minister of Serbia. His commission concluded that the two soldiers were shot by a third party but the exact situation has never been clarified, except that the commission reject almost all findings of the first, internal military investigation. Not having any solid evidence or conclusions, it is widely suggested by the press that the two guards were the witnesses of either a high-profile indictee (as it was suggested at the time, Ratko Mladić) of the International Criminal Tribunal for the Former Yugoslavia, who was supposedly hiding in the undergrounds of the Topčider complex, or some criminal activities, like smuggling. ^ Biljana Đorđević Mironja (21 July 2018). "Андрићев ратни излет" [Andrić's war picnic]. Politika-Kulturni dodatak, year LXII, No. 15 (in Serbian). p. 01. ^ РТС: "Прокоп од данас главна железничка станица", rts.rs; accessed 23 April 2018. ^ Dejan Aleksić (16 January 2018). "Posle 134 godine bez vozova u Savskom amfiteatru" [No more trains in Sava amphitheater after 134 years]. Politika (in Serbian). pp. 1, 16. ^ Dejan Aleksić (16 June 2018). "Zaboravljeni koloseci od danas glavni za vozove ka Baru" [Forgotten tracks from today are the main ones for trains to Bar]. Politika (in Serbian). p. 13. ^ Dejan Aleksić (20 January 2018). "Za pun život Mosta na Adi još tri velika koraka" [Three more big steps for the full life of the Ada Bridge]. Politika (in Serbian). p. 15. ^ Daliborka Mučibabić, Dejan Aleksić (30 September 2018). "Нови саобраћајни тунели под водом, кроз брдо и центар града" [New traffic tunnels under water, through the hill and downtown]. Politika (in Serbian). Wikimedia Commons has media related to Topčider.